Traditionally speaking, wedding day itinerary has always followed a very specific format, which is why as guests, we have known what to expect down to the dinner menu, and sometimes even the song selections. But, now weddings are becoming more and more unique, and guests are looking forward to surprise elements. It is with great gratitude that we thank you, Vinton Cerf, Robert Kahn, Bill Gates, Tim Berners Lee, Steve Jobs, MIT, and all of you other brilliant Internet creating nerds, for giving us a new medium for inspiration. It is because of you that we now know we can serve more menu options to our guests than just “chicken,” “fish,” or “beef.” Finally, we have an alternative platform than just those antiquated bridal publications that, let’s face it, typically utilize the majority of their content space to showcase obscure European designed gowns that none of us would ever feel comfortable wearing. Thankfully, these magazines (ran by a handful of people) no longer dictate what the emerging trends should be, or set the bar for what your wedding day should look like. Thanks to the Internet, and all of the goofiness that comes along with it, newly engaged couples can take advantage of sites that are designed to educate and inspire. They now have a real-time platform that allows them to interact & bounce ideas. Today, couples are less concerned about the traditional details of their weddings, and more concerned about the overall experience. The wedding goal in 2018, is to discern how best to incorporate the personal and unique touches that express you as a couple. With that said, the elements that you will start to see in 2018 & 2019 that are being integrated are very off-beat, non-conformist and unconventional. They are in fact, very “Boho,” or Bohemian. And, that, my friends will be the buzzword in the wedding industry for the next two years. Hotels, ballrooms, museums, country clubs, etc. are still being utilized, but younger couples desire a less stuffy, more relaxed atmosphere that can easily be transformed into their Bohemian Rhapsody! Fall continues to be the most popular time of the year to tie the knot, with 40% of all weddings taking place between September and October. Engagement periods are getting shorter, and most couples are planning their weddings in 8-10 months instead of waiting a year or longer. Who would have thought that the Pantone color of the year (make that the next 2-3 years, because it takes time to establish a trend) would be ultra violet? To be more specific, this lovely shade is known as Pantone 18-3838, and while it may a bold, and classy choice for our summer, fall and winter brides, I find it difficult to believe that spring brides will be able to utilize it tastefully. The good news for you spring trendsetters though, is that the elegant Aquamarine, and Custard, are still both popular favorites. What is also hip and cutting edge right now is to build your wedding day colors off of the entirety of a Pantone color palette, instead of just one shade. When doing so, you need not obsess about whether or not your flower colors match up perfectly to your bridesmaids’ dresses and table linens as long as you work within the palette spectrum for your accents. Designing, or decorating for a wedding in this era is less about creating the perfect “princess party,” and more about crafting an experience by unleashing your inner interior decorator. If you are clueless about interior decorating, ask for help, or just stick to your guns and throw this trend out the window. If you want a princess party, then you should have it. And the cake! Think vintage, and all of the fabrics that invoke a feeling of vintage- that's what you can look forward to seeing at weddings over the next few years. Tufted chenille, macramé, lace, velvet, and lots of layered ruffles. It is now safe to not only take your pick of one or two, but to incorporate a wide facet of fabrics at your event. It's cool. You’re a non-conformist, remember? Go green, because it’s all about the greenery! But, where flowers are concerned, the stunning, magical, but potentially budget draining trend is the ceiling installment. Yes, that is correct: Overhead. Floral. Installment. Can you imagine a more beautiful conversation piece? I have yet to chat with a florist about this emerging idea, but I can only imagine that to achieve the full effect, one must be prepared to pay a pretty high dollar price. Now, that is not to say that this concept could not be integrated on a smaller, more intimate scale for affordability, but choose your installment positioning wisely. If you skimp out, you may not achieve an all encompassing look, and the results could be lack luster, and a waste of money. Once an elegant choice, large floral centerpieces are now a “flower faux pas.” Brides are now choosing lower profile arrangements in an attempt to make the table more socially inviting. In fact, a lot of brides are doing away with flowers as centerpieces all together, and are instead opting for more greenery with the use of fresh herbs, moss balls, terrariums, fresh plants, (which can also serve as a take home for guests) dried hydrangea, etc. Even more notable, is that some brides are electing to remove the "living element" all together, and are choosing flame less candles and geometric glass and metal centerpieces. The use of metal will become more prevalent in the coming years with the majority of brides leaning toward rose golds and bronze hues. While on this note, couples are also starting to integrate gemstones, marble and other natural rocks for a raw, and earthy look. As for bridal bouquets, the "cascade bouquet," reminiscent of the 80’s, is all the hotness, and for good reason! Not only can the boho use of heavy greenery be implemented, but the cascade effect is a great choice for brides wanting to carry an onlooker’s eye downward for a glimpse of those slammin’ shoes that she’s wearing! Brides are moving away from the traditional white, or champagne colored shoes, and are incorporating color. Not only is this an expression of who they are, but that pop of color makes for great photo opts! Note the traditional “something blue” shot above. Aside from sassy footwear, couples are primarily keeping it simple. As for the groom, he is making a more casual appearance. The three piece suit has become the new tux, and the vest and tie combo is now the three piece suit. A lot more couples are opting to use services like theblacktux.com and are doing away with time consuming fittings. Many brides are allowing their bridesmaids "free range dress selection," as long as the colors chosen are within the brides color spectrum. (Which is a fantastic confidence booster, because bridesmaids can now choose the style and color most flattering to them) Hair and makeup have made the shift from big and bold, to a more natural appearance with a focus on highlighting natural features. The "Hollywood-esque," days of glamorously painted eyes with glitter and shimmer are over. Another new bridal party trend on the horizon is mixed-gender bridal parties. If your bestie happens to be a guy or a gal, they can now stand by your side with little to no judgment. Bridal parties are also becoming smaller and more intimate, so don’t feel so stressed about having to include ALL of your friends, or even making sure that the numbers even out on both sides. Food trucks, are still a popular reception feature, but they are now making their appearances late night as guests are leaving. While the caterer will typically make a to-go box for the bride and groom at the end of the night, your wedding guests don't receive the same courtesy. As a party going guest, there is nothing better than having the option to grab some french fries and a BBQ sandwich just before heading off for the after party, or to retire. Sadly, there is an emerging trend attempting to take root that will decimate a time-old tradition. While I wholly oppose it, and will encourage you not to throw this one to the wayside, I will pretend to respect your decision should you decide to break the hearts of your parents. (Just setting you straight up front.) There is a special dance reserved between the bride and her father, and the groom and his mother that will provide you all with an irreplaceable, and special moment to be cherished. If you have even a "semi-healthy" relationship with your parents, please don't consider these dances to be optional. Don't rob yourselves or your parents of this valuable experience. You may regret it one day. Trust me. Sparklers are a beautiful send off, but a lot of venues are no longer allowing them, and thus they are becoming less popular. 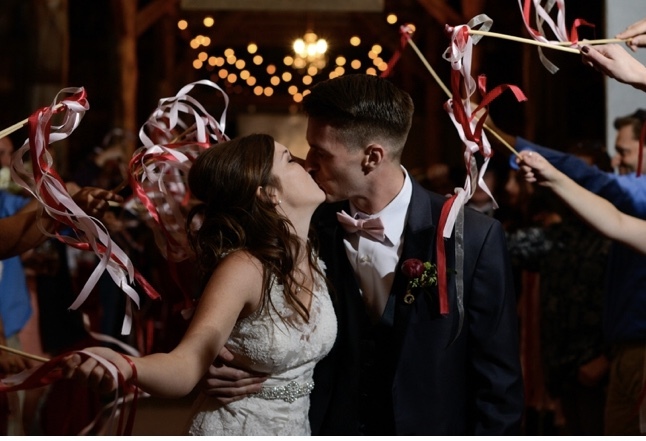 (Lucky you, we still allow them) In their place, however, we are seeing the use of ribbon wands, which still make for a beautiful exit and gorgeous photographs! A lot of couples are opting for “mini-moons,” following their big day, and are instead planning their honeymoons months down the line after they have had a chance to unwind from their wedding day bliss. This is a trend that we back 100%! There is nothing wrong with taking some time after your reception to reset, enjoy being married, and then scooting out of town for some fresh excitement once your wallet and nervous system have had time to recoup. For those of you reading this blog that may currently be planning your special day, my advice to you is to trust yourselves. Make decisions that are in alignment for you as a couple, and stay in your integrity. Respect the elements that make you unique as a couple, and let your special day reflect that uniqueness. If you are “boho,” then be Bohemian, and if you are a cowboy & cowgirl, then for heavens sake, let there be leather and lace! For more awesome suggestions and information, Click Here to visit WeddingWire! If you have not had the opportunity to visit our Barn venue yet, give us a call to schedule a tour! We still have a few 2018 dates left available, and are currently booking 2019 & 2020.